Green tea preparation: a complete overview of the key factors in the correct preparation of green tea, e.g. brewing time, temperature, dosage and utensils. In Asia, particularly China and Japan, green tea and its skilful preparation has been a treasured cultural tradition for many centuries. Due to the multitude of different green tea varieties, the various qualities and contrasting social and historic influences, a very refined art of tea drinking has developed, the peak of which is demonstrated in the traditional tea ceremony. In this article, we will explore the refined techniques and accomplishments of traditional tea culture and give recommendations on how the health potential of each type of green tea can be maximised through proper preparation. In addition to selecting tea of an adequate quality, numerous other factors play an important function in obtaining the health benefits of green tea. Correct tea preparation is almost as important as tea quality in facilitating the health benefits of green tea. In native green tea regions, this has been known for millennia. The author of the first book on green tea, Lu Yu, devoted himself in detail to this topic in the 8th century AD. He also wrote a further book in which he systematically recorded the significance of different types of water on the effects of tea. It is therefore worth taking a closer look at the health aspects of tea preparation. In practice, the preparation of each tea variety should be carried out individually and can be varied or optimised in terms of taste. It is important to place special emphasis on activating the health benefits of each type of green tea in the best possible way. The different varieties – in particular Sencha, Gyokuro, Shincha, Matcha, Bancha, Benifuuki and Karigane – can thus be brought together into an overall health package, in which their different biological workings compliment each other in an excellent way. The two most important factors for maximising the health benefits of green tea are the brewing time and temperature of the water. Depending on these two factors, different >>ingredients<< infuse into the tea water and produce very different >>effects<<. For instance, a high water temperature reduces/damages certain substances (e.g. vitamins, antioxidants, amino acids) and dissolves others more effectively (e.g. >>oxalic acid<<, certain tannins and catechins). Conversely, certain active ingredients are bound too little or hardly at all in the water when the temperature is too low. The same applies to the brewing time of the tea. Ultimately, any tea preparation is a compromise to optimise health effects by achieving the best possible mixture of substances. This does not depend on the workings of individual substances on their own, but on the complex benefits of the mixture; the unique blend of active ingredients in green tea is primarily responsible for its major health benefits. Most ingredients produce a much healthier effect through binding to certain ingredients and buffering others. 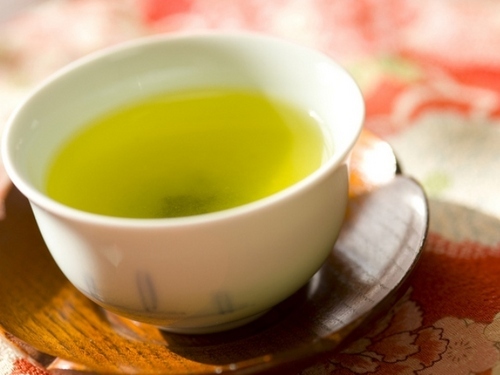 Besides these two most important factors, other aspects of green tea preparation are also significant and not to be neglected, such as: dosage, number of infusions, type of infusion, when and how fast to drink, keeping the tea warm, water quality, material and type of teapot or vessel (for infusion but also for heating the water), as well as material and pore size of the tea strainer and other important utensils. All of these factors are outlined in the table below and explained in more detail in related articles. Each factor plays an important role and contributes to the exceptionally high health benefits of green tea. They usually also have a positive effect on the taste of the tea. For certain applications and to tackle health problems, it is sometimes necessary to deviate from the recommendations for standard green tea preparation. When it comes to using green tea medicinally, obtaining general health benefits from a combination of tea varieties is not the priority. Instead, by means of different brewing times and temperatures, a certain mix of ingredients can be activated in the tea, which are particularly beneficial for specific areas of health. 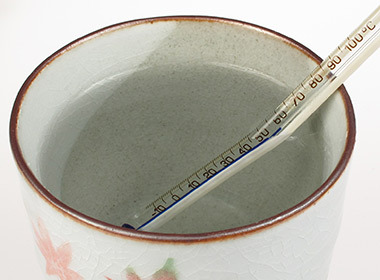 In contrast, some tea varieties can even be counterproductive for certain health problems. A comprehensive table of use cases can be found in the article: >>Preparation for Diseases and Health<<. For the preparation of Matcha, different rules apply than for the other green teas. You will find detailed instructions on how to prepare Matcha tea traditionally and how to optimise its health effects in the article >>Preparation of Matcha Tea<<. The same applies to the relatively young variety Benifuuki (see our article on >>Benifuuki<< and its preparation for specific health applications). Special notes on the preparation of the different Sencha and Gyokuro qualities can be found in the articles >>Preparation of Sencha<< and >>Preparation of Gyokuro<<. In the following table, we have compiled an overview of the most important aspects of green tea preparation. These recommendations offer a general orientation for an everyday supply and are based on studies, personal experience and kinesiological testing (not scientific), referring secondarily to the taste effect. The values given for temperature, brewing time and quantity were individually developed according to the green tea varieties (and picking). Experience has shown that even slight deviations in preparation can cause significant changes, even to the point of ineffectiveness. Occasionally green tea can carry side effects or risks. According to our observations, however, good taste goes hand in hand with a correct, healthy preparation method. Of course, depending on the season and tea garden, the teas are slightly different. There is thus no one rule for the preparation of all teas. In our experience, however, the following recommendations still apply to almost all tea gardens and varieties of high-quality green tea. People with a good understanding of their body should take this information as the starting point for their own individual, context-specific use of green tea. With Chinese, Indian, Nepalese and Tibetan green teas, which are usually roasted and in which many healthy ingredients are impaired or no longer present, it is certainly possible to optimise preparation in terms of taste in other ways. However, we will not be covering this area here. >>Brewing time<< Allow to brew for exactly 2 minutes. The longer the brewing time, the more bitters/tannins infuse into the water to a certain point. The tea tastes correspondingly bitterer. Caffeine is already significantly present in the tea water after 30 seconds. For optimal health effects, only one infusion is best with recommended infusion time (2 minutes as a rule, but adapted according to health application). For variations in taste (traditional) also multiple infusions possible for high quality teas. Also here we recommend a brewing time of 2 minutes and no longer. Within the first 10 minutes, quickly (otherwise the tea looses its ingredients and effects). Exception: in the case of special preparations (for certain health applications) above 80°C, the tea lasts several hours. It is recommended not to heat such tea permanently if it is kept for a longer period of time. In contrast to coffee, the caffeine in green tea is bound to tannins and is significantly more tolerable through the amino acid L-theranine. In this mix of substances and within the recommended limit, caffeine is extremely beneficial for health. Should the tea be washed or “opened” beforehand? We consider cups with light or white interior colour made of porcelain, ceramic or glass to be ideal for green tea. This is an opinion shared by the “tea pope” of ancient China, Lu Yu. With this bright or transparent background, it is possible to properly perceive the colour and structure of the green tea, as well as its floating particles. This prepares the digestive organs better for consumption and influences the metabolism of the healthy ingredients in a positive way. The brewed infusion should be drunk as quickly as possible. According to our findings, this should be done within the first 10 minutes of tea preparation; after this point, the health effects decrease rapidly. For this reason, smaller quantities are also suitable as a portion – we recommend the preparation of 0.5 l that can be quickly consumed. Green tea should not be kept brewing on the stove or in a thermos. Tea lovers will soon realise that the use of the right utensils makes a small but subtle difference. Those made of wood have proven to be particularly effective. In Japan, very pretty wooden spoons made from cherry are often used instead of metal spoons for handling green tea. Thin bamboo spoons or spatulas are best for Matcha or Benifuuki powder. In our opinion, this has a positive energetic influence on the tea and significantly improves the everyday tea ceremony.